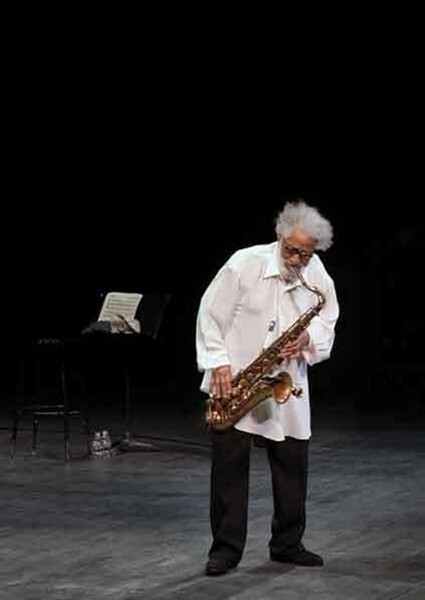 Sonny Rollins at NJPAC in 2011. Interviewing the great Sonny Rollins for the August 2011 issue of Chronogram easily stands as one of the greatest moments of this humble music journalist’s career. At that time, the monumentally influential saxophonist and composer was still living in Germantown, where he’d been since moving there with his late wife Lucille in 1972; the jazz giant, now 87, eventually relocated to Woodstock. Being in that town puts him much closer to environmental sculpture Opus 40, the site of a transcendent 1986 concert by Rollins and his band filmed by Robert Mugge for the documentary Saxophone Colossus—which was recently released on DVD. Featuring intimate interviews with Rollins as well as noted jazz critics Gary Giddins, Francis Davis, and Ira Gitler, Saxophone Colossus also includes footage of a concert in Tokyo, Japan, that saw him perform with the Yomiuri Nippon Symphony Orchestra. The DVD release boasts updated commentary by Mugge. Saxophone Colossus is out now on MVD Visual. For more information, visit http://www.mvdvisual.com/.